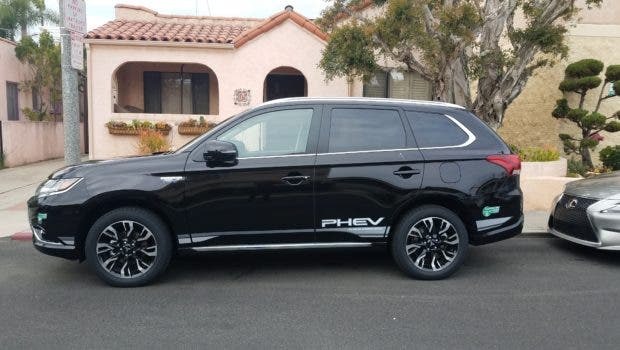 In part one of the Mitsubishi Outlander PHEV review we’re conducting here on CleanTechnica, I covered how the SUV functions and some of its features. In part two, I’ll talk about performance and how it feels to drive the Outlander PHEV. Mitsubishi estimates the MPGe (miles per gallon equivalent) is 74, but we tend to stay away from this odd estimate of average fuel economy. 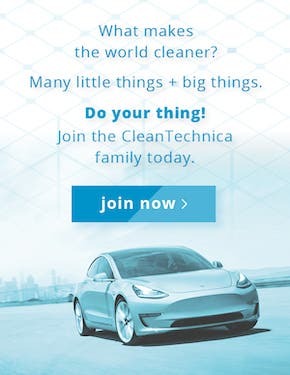 More to the point, the EPA claims 45 kWh per 100 miles on electricity, while we reached an average of 36 kWh per 100 miles in mixed driving consisting of 75% city and 25% highway driving. We also got an average of of 35 mpg on gas (less than 15% of the test drive), which is better than the EPA’s estimated 25 mpg. The Outlander PHEV uses two electric motors, one for the rear axle and one in front. Traction control is provided via the company’s 4 wheel drive system, the Super All-Wheel Control (S-AWC). 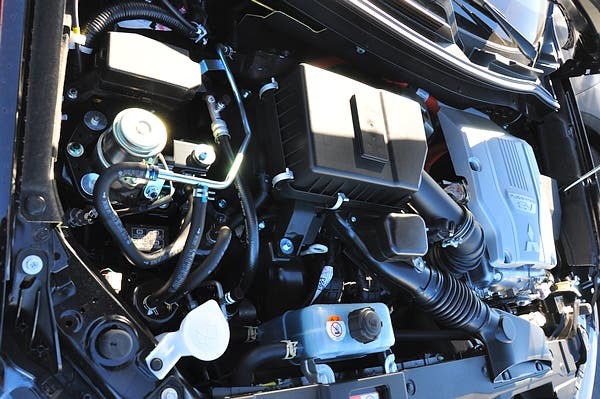 It also manages an active yaw control, ABS, and Active Stability Control (ASC). 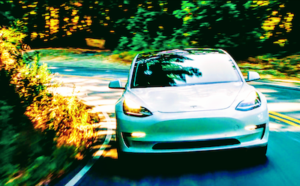 The rear electric motor is more powerful than the front, but the engine can drive the front wheels. 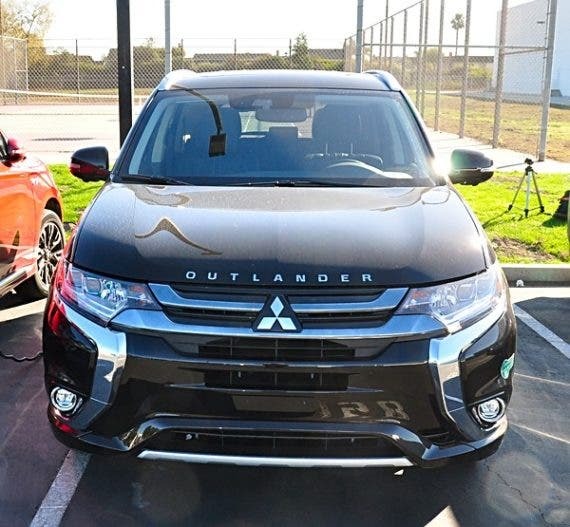 Not that you will notice this — the Outlander is smooth as it switches from series to parallel. The only time you will hear the difference is when the engine kicks in. What sets the Outlander PHEV apart is that anyone can drive it, whether they understand what a PHEV is or not. The Outlander PHEV automatically chooses the best use of its hybrid platform, but it also lets you select the mode you want — EV Mode, Series Hybrid, or Parallel Hybrid. 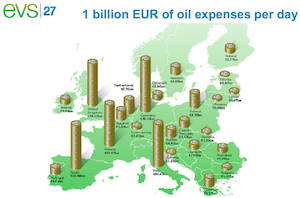 Add to this the EV Priority and ECO Mode that respectively allow driving on electricity mainly (EV Priority) or only (ECO Mode) and the SUV can meet the needs of many. Another thing that sets it apart from the competition is that the Outlander PHEV can tow 1,500 lb, a first in that category. Cargo capacity is generous as well, as you expect from an SUV. It’s 30.4 cubic feet. Charging on a Level 1 electricity outlet takes 13 hours. Level 2 gets that down to 3.5 hours. Finally, CHAdeMO fast charging does the job in 25 minutes. The Outlander PHEV impressed us with a very good turning radius, 35.6 feet. We were able to hang U-turns on most streets. 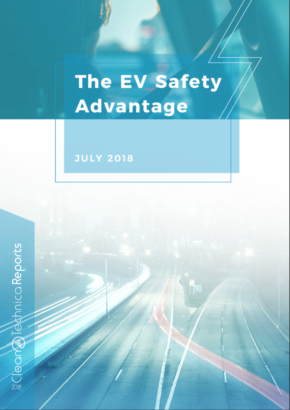 The estimated EV range is very optimistic. The SUV greets you by displaying 37 miles, but that turns out to be more of 20+ mile range. We achieved close to 30 miles, but only after hypermiling and never going above 40 mph. The cold Californian morning temperatures (don’t laugh) of 40°F (4°C) were partly responsible for that range hit, it should be noted. Especially for an SUV, 20–30 miles still puts the Outlander PHEV well above the competition, which hovers around 14 to 16 miles currently. We felt Mitsubishi might want to change this estimate, though, as it is bound to frustrate more than a few drivers. The big disappointment was that we were not able to get our Android phone to work with the company’s Mitsubishi Outlander PHEV II app. We hope to conduct a second test drive where we can test that out. SUVs usually feel bulky and awkward. While most can accelerate in a straight line, nimble, they are mostly not. That is not the case with the Outlander PHEV. It felt nimble and surprisingly brisk. The paddle-shifting regenerative braking modes were unintrusive. There are 5 options (B to B5), B5 being the most regenerative. We feel 3 modes would be enough for most drivers, but more options = better than fewer. The quiet ride! We liked the sound of the Mitsubishi electric motors. They sounded good and that was perhaps due to the fact that there are two and the harmony between both was nice, loud enough to warn pedestrians. However, when the engine kicked in, it was a different story. The gasoline engine, sadly, reminds you that you are in an internal combustion engine (ICE) vehicle. It’s not as loud or bad as the first BMW i8 generation, but it is intrusive. Thankfully, Mitsubishi’s generous Rockford FOSGATE stereo system nullifies that. The center part of the dashboard can be cycled to show various hybrid modes, displaying the amount of energy used and trip odometer. The entertainment system displays all of this in greater details. The adaptive cruise control worked as advertised, adapting to traffic conditions appropriately. Another feature is the 380-degree camera view. Depending on your generation, this is either the greatest thing since sliced bread or the strangest unnatural parking aid! The rear cross-traffic alerts were also not intrusive. They just beeped and warned us cars were close. The forward collision warning was a beep and big yellow sign that said “BRAKE.” The same beep also warned us of any sudden lane departure. We particularly like the way Mitsubishi treats its driver in a mature way. Some other carmakers’ security systems are too in our face or even take over in an unwanted way. 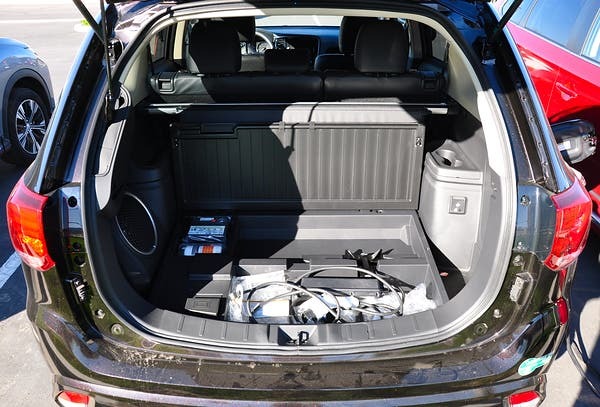 The company warranties the Outlander PHEV for 10 years and 100,000 miles and offers a $2,000 factory rebate, $0 down for the first 60 months, and a leasing option of $289 a month with $4,088 down (in California). 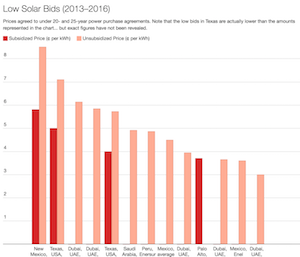 It is eligible for the federal income tax credit — up to $5,836 — which can bring the price down to below $30,000! We waited a long time for the Mitsubishi Outlander PHEV — at least, here in the US (while Europeans were gobbling them up). It was worth the wait even though we feel it should have been here 2 years ago. Overall, the Outlander PHEV doesn’t have a lot of true competition. The BMW X5 xDrive40e, the Volvo XC90 T8, and the Porsche Cayenne S E-Hybrid are the closest, but they all offer about 14 to 16 miles in EV mode compared to at least 20 for the Outlander PHEV, and they’re all considerably more expensive. The Outlander PHEV is a comfortable ride with good performance. 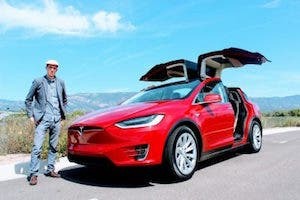 We liked the way it treats its drivers by letting them choose the mode they want or letting the vehicle’s intelligence system do all the work. The driving aids only beep and don’t take over the driving experience. We also liked how the interior felt, with its subtle luxury that doesn’t try too hard to keep up with the Joneses. The only things we didn’t like as much were slow automatic opening of the rear trunk door and not being able to lock the vehicle while that door is in motion. 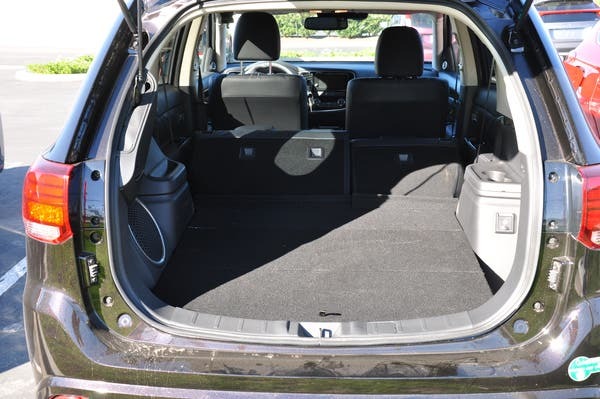 While the entertainment system shows its age, at $35,000, the Mitsubishi Outlander PHEV is a serious contender for many weekend warriors or families needing space. We give the Outlander PHEV 4½ charging plugs out of 5. Congratulations, Mitsubishi — we can’t wait to see how you will evolve the Outlander PHEV. Now, can we have an Evolution PHEV as well?